Since I’ve been making homemade yogurt in my Instant Pot, I needed some homemade granola to make the picture complete. It took me a couple of tries to get this Gingersnap Granola just right, but I think I finally did it. 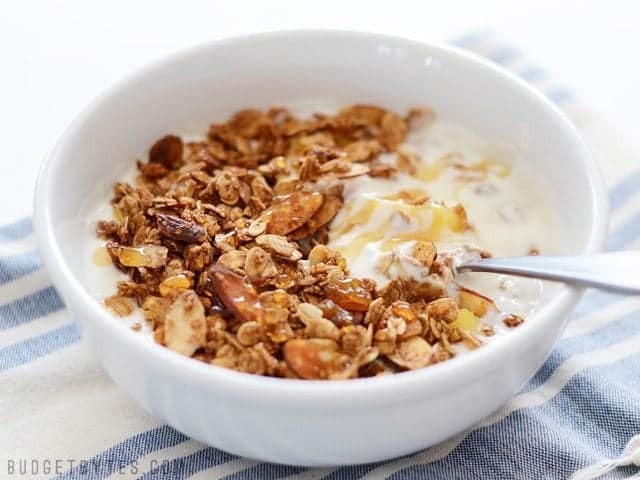 The molasses gives this granola a nice deep flavor without being too sweet, and the warm spices are just strong enough to give a hint of “gingersnap” without being over powering. I’ve added oat bran to this granola which I feel gives it a certain body and thickness that my first batch did not have. I know it’s kind of an obscure ingredient, but it’s definitely worth getting. IMHO granola should always have some sort of dried fruit and some sort of nut. I happened to have an old box of golden raisins in my pantry (I wonder how long those are actually “good” for? ), so I used those for my Gingersnap Granola. Candied ginger, although not really a fruit, would also work well and give more of that gingery effect. Sliced almonds were the best priced nuts at the store and I happened to love them, so that’s also what I went with this time. Pecans would be also be a great choice, though! 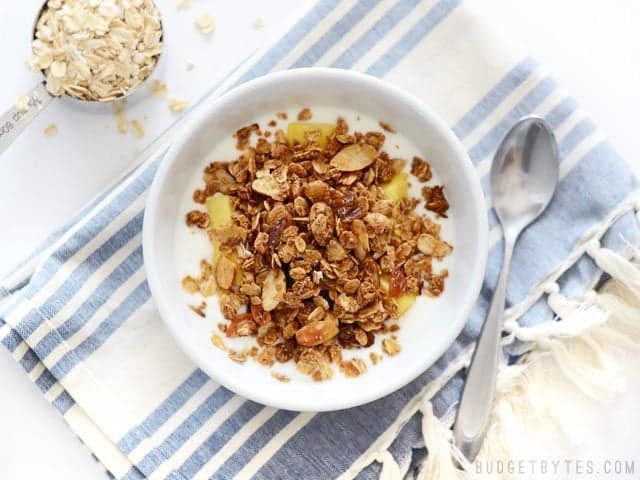 I ate my yogurt and granola with some fresh pineapple (on sale, yay!) and I must say, pineapple + ginger = awesome! Gingersnap Granola pairs the rich, deep flavor of molasses with warm spices like ginger, cinnamon, and cloves. 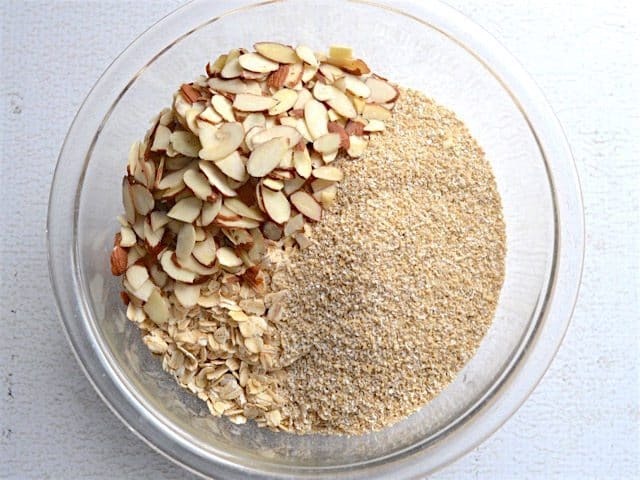 In a large bowl, stir together the oats, oat bran, and almonds until well mixed. 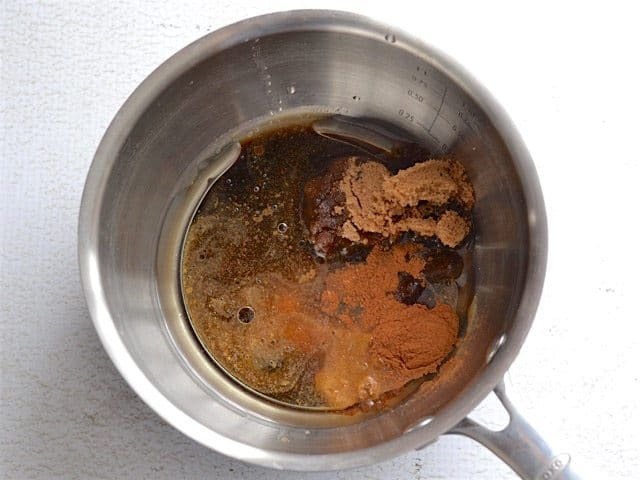 In a small sauce pot, combine the molasses, brown sugar, oil, water, ginger, cinnamon, cloves, and salt. Heat and stir over a low flame until the brown sugar has dissolved and the mixture is liquid. Pour the molasses mixture over the bowl of dry oats and mix well until all of the oats, nuts, and oat bran are well coated. 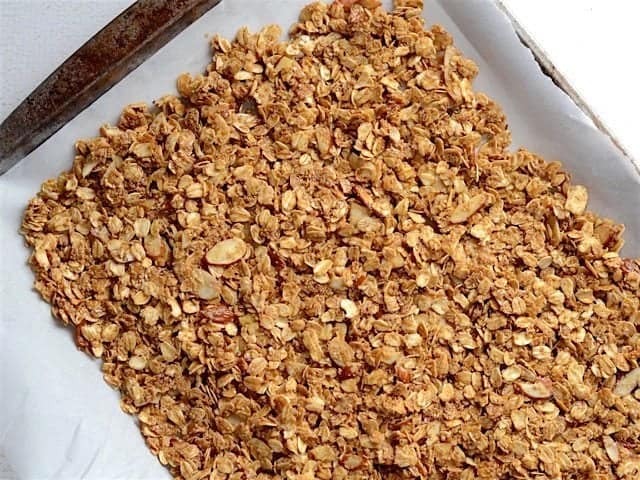 Pour the wet granola mixture onto the baking sheet and spread it out into a single layer. 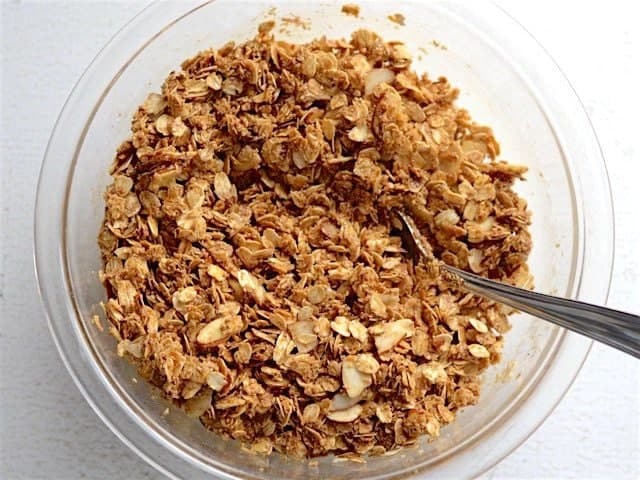 Bake the granola for 20 minutes, then give it a good stir. Bake for another 10-20 minutes, or until light golden brown (the total time will depend on the size of the baking sheet and how thick the granola is layered). Remove the granola from the oven and stir in the raisins. 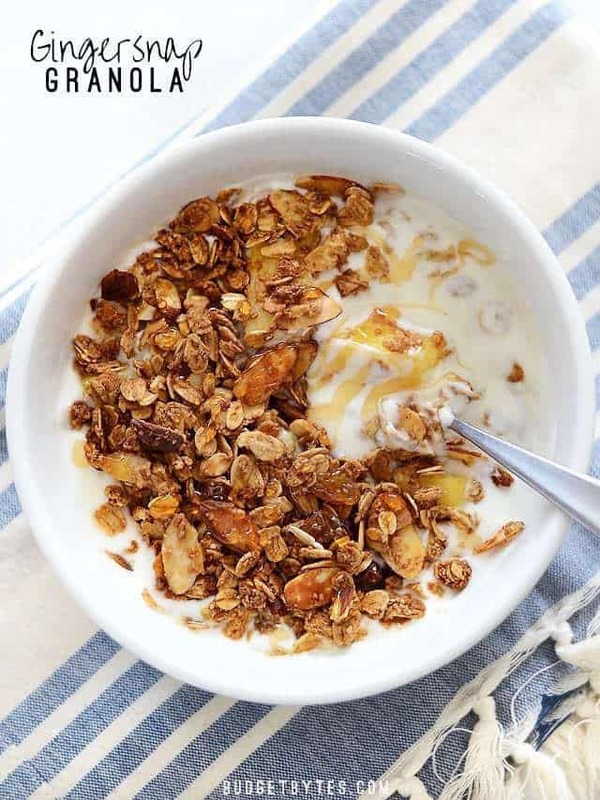 Press the granola down into a compact layer and allow to cool. Once cool, break it up and store in an air-tight container. *You can grate some fresh ginger into the sauce pot for extra snappy ginger flavor! Preheat the oven to 300 degrees and line a baking sheet with parchment. 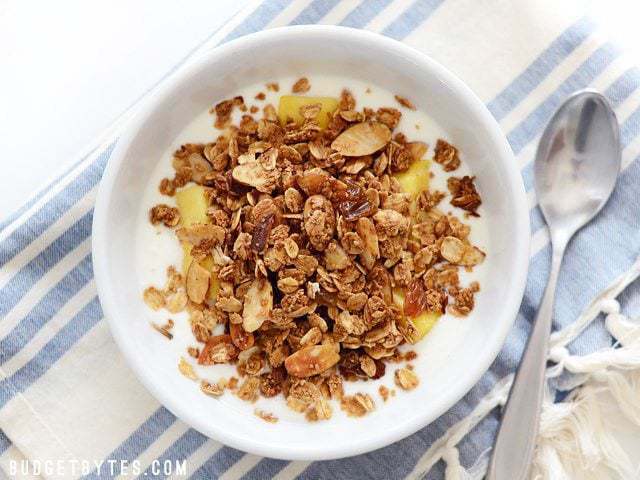 In a large bowl, stir together 4 cups old-fashioned rolled oats (they have more texture than quick oats), 1 cup sliced almonds, and 1 cup oat bran. Stir until they’re all well mixed. In a small sauce pot, combine 1/4 cup molasses (not “black strap” molasses), 1/3 cup brown sugar, 1/4 cup canola oil, 1/4 cup water, 2 tsp powdered ginger, 1 tsp cinnamon, 1/4 tsp cloves, and 1/8 tsp salt. Heat over a low flame and stir until the brown sugar is dissolved. If you want EXTRA gingery flavor, you can grate some fresh ginger in there, too. YUM! 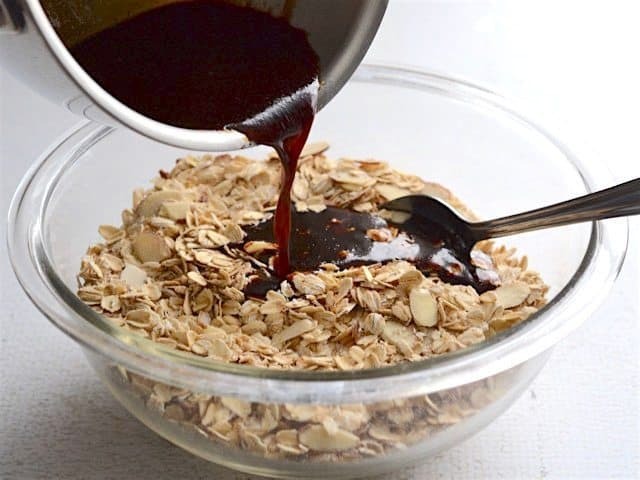 Pour the molten molasses mixture into the bowl with the oats, nuts, and oat bran. Stir really, really well so that all the oats, nuts, and bran are coated in the molasses mixture. 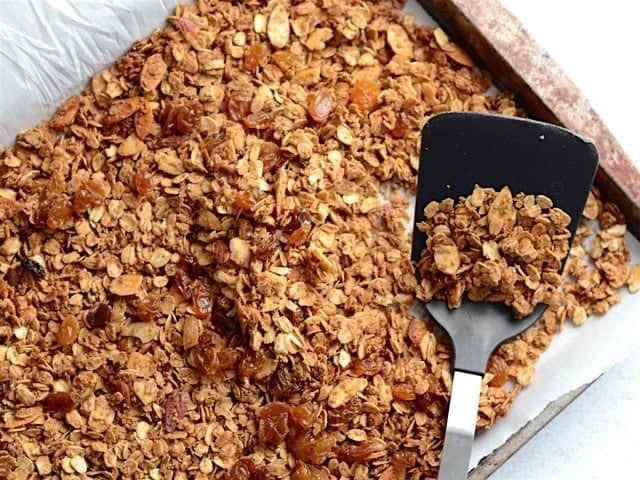 Spread the wet Gingersnap Granola mixture out over the prepared baking sheet. Bake in the preheated oven for 20 minutes, then stir. Bake for an additional 10-20 minutes, or until it’s lightly golden brown and smells slightly toasty. Like this! The total baking time will depend on how big your baking sheet is and how thick the layer of wet granola is. Once it’s finished baking, stir in 1/2 cup golden raisins. 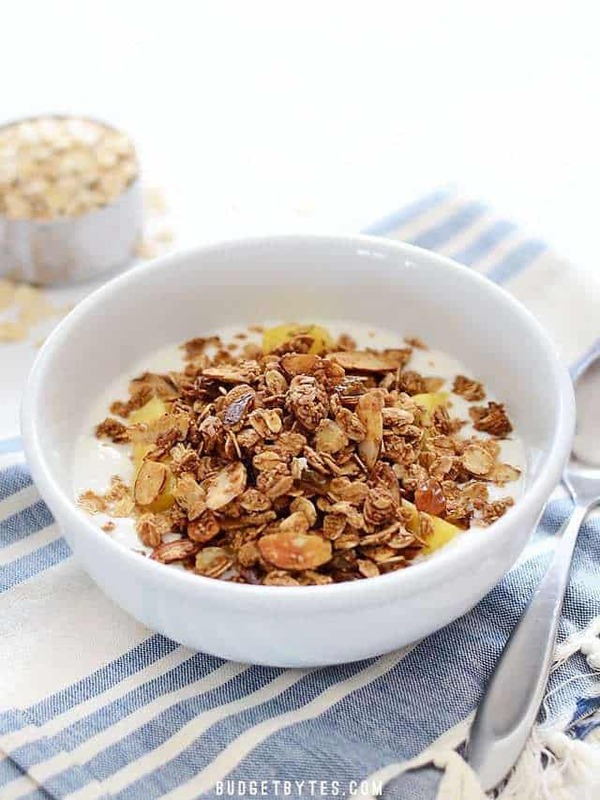 Press the granola down into a compact layer and let it cool (pressing it down before it’s cooled helps it clump up). Once cool, store it in an air-tight container. I ate my Gingersnap Granola with homemade yogurt and some fresh pineapple. Delish! I’ve made this a couple of times now. The first time I made it completely as directed. Great! But I wanted more molasses flavor, so the second time I made it, I switched the amounts of brown sugar and molasses and I like it even more. I also pressed in 2 tbsp of flax seeds on the top after stirring the sugar liquid into the mixture and putting it on the baking sheet, so the seeds would stick to the granola clumps, to make this more helpful for breast-milk production. Mixed with a cup of plain whole yogurt and a half an apple sliced up, this breakfast is the best! Just made this today. I wasn’t so sure about cloves because I don’t usually like it, but it was hardly noticeable. I also only had black strap molasses so I only put a tablespoon of it in. It took all I had not to eat it all while I was waiting for it to cool. It’s pretty amazing. This is in the oven now and smells delicious! I used pumpkin seeds in place of sliced almonds. Cant wait to share this with my friend who loves gingersnaps. Just made this and my roommates are jealous of how amazing the apartment smells. Can’t wait to dig in! I also used half and half golden raisins and chopped crystallized ginger.